As the top Emirati media executive, industry eyes are now upon the Minister following the news that the Dubai International Film Festival will no longer take place this December but will eventually re-emerge next year in a biennal format still apparently being working out by the Dubai Creative Clusters Authority. 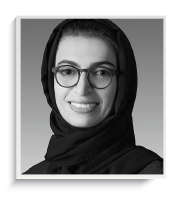 Will she be able to ensure that DIFF maintains the developmental remit that is an evident component of Twofour54, the Abu Dhabi media campus that she chairs? She also sits on the board of ImageNation.